People watch movies for several reasons. Some, to escape reality and others to face it. Nevertheless, there are those of us who would just want to watch a movie just to have a look at our worst nightmare on the screen. Yes, we are the sort of people who would like to see our greatest fears in movies rather than experience it (obviously). This probably accounts for the reason why one of my favorite movies of all time is ROBIN HOOD. I mean the idea of a magnanimous super-hero, who robs the rich to feed the poor, told by the storyline of this movie is simply awesome. Robin Hood, goes about ROBBING the rich neighborhoods (PUN INTENDED), just to put food on the tables of the less-privileged in the community. If only AFRICAN politicians would grasp this concept other than doing the reverse of it. Anyway, back to the topic: Robin Hood. Never have I seen with my eyes armed robbery idealized and glamorized in such a manner. His conduct as a robber is so idealized to the extent that, it is simply absurd for one to entertain the thought that what he does is wrong. Victims of the crime are portrayed as deserving the crime, and the beneficiaries portrayed as deserving the loot. It is only in movies that one’s morality could be so tampered with to the extent that he becomes the strongest advocate of wrongdoing. The big question then is, ‘Will Robin Hood’s character excite us in real life?’. Ha! Certainly not!!!!! There is one thing that I know, and that is, there are several Robin Hoods around nowadays. And there seems to be a high concentration of this rare specie of men in and around the KNUST campus this semester. Is it not hypocrisy for the same character to induce joy in viewers(of a movie) but then become the target of insults and curses in real life??? 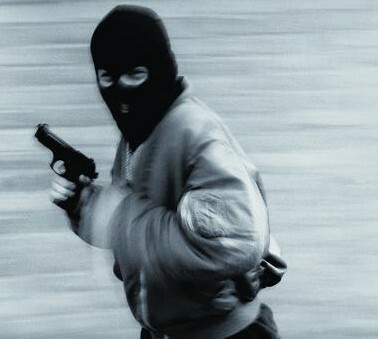 Present day or real life armed robbers are simply ‘ROBIN HOOD IMPERSONATIONS’. They also rob the rich to feed the poor. So then why are we not too amused about their doings? Oh I get it, it’s because we are the victims here. We are the so-called rich who are robbed to feed the poor. It is just annoying what these robbers are doing to students on campus and they use the most sophisticated equipment too. The results their ‘gadget detector’ is chalking is simply unprecedented. From their various hideouts, this highly sophisticated equipment leads them into hostel rooms that are heavily stocked with electronic gadgets. They break in, rob what they can, destroy the ones they cannot and leave a mark of their love on your body. Something you can always remember them by. Wow!!! How cool is that??? We just thank God for the presence of the military on campus. That is just a breath of fresh air. So as I ponder over these issues, that soft voice in my head tells me ‘this is just man’s definition of robbery’. Then I replied, ‘so you mean, God’s definition of robbery is totally different???’. Well, certainly YES!!!!. The bible says that in Malachi 3:8. Those who do not pay their tithes are robbing God of what is due Him. Ha! That is scary. Bottom-line is, robbery of all kinds is wrong. Be it against man, God or even in a movie. They rob us, we rob God. Meaning we have no moral justification to judge those robbers though. Before we judge them, can we just return every loot we’ve robbed from heaven?